Every member country of the WBF is entitled to participate with one representative (national) team in each of the three series of the competition. Following the fashion of the Olympic Games, the World Team Olympiad is held on leap years only. 53 Open Teams attended the 15th edition of the World Bridge Games in Wroclaw, Poland. In the Open Teams, the Dutch squad defeated Monaco 155-134. The Bronze went to the Polish team who defeated Spain. 1.NETHERLANDS: Sjoert Brink, Bauke Muller, Bart Nab, Bob Drijver, Bas Drijver, Simon De Wijs, Anton Maas (captain), Ton Bakkeren (coach). 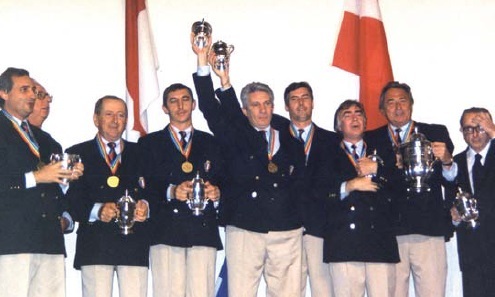 2.MONACO: Tor Helness, Geir Helgemo, Pierre Zimmermann, Franck Multon, Jean Charles Allavena, Krzysztof Martens (captain), Dominik Filipowicz (coach). 3.POLAND: Piotr Gawrys, Krzysztof Jassem, Jacek Kalita, Michal Nowosadzki, Michal Klukowski, Marcin Mazurkiewicz, Piotr Walczak (captain), Stanislaw Golebiowski (coach). 1. SWEDEN: Krister Ahlesved, Peter Bertheau, Per-Ola Cullin, Fredrik Nyström, Jonas Petersson, Johan Upmark, Mats Axdorp (NPC), Jan Lagerman (Coach). 2. POLAND: Cesary Balicki, Krzysztof Buras, Grzegorz Narkiewicz, Piotr Zak, Jerzy Zaremba, Adam Zmudzinski, Piotr Walczak (NPC), Marek Wojcicki (Coach). 3. MONACO: Fulvio Fantoni, Geir Helgemo, Tor Helness, Frank Multon, Claudio Nunes, Pierre Zimmerman, Jean-Charles Allavena (NPC), Krzysztof Martens (Coach). The 2012 World Bridge Games were again held under the aegis of the World Mind Sport Games; however on this occasion it was a smaller event as the Junior events which had swelled the number of players so greatly in Beijing were not staged on this occasion. 60 Open Teams, 43 Women’s and 34 Senior Teams entered the Games, with the Open Championship seeing a strong Swedish team winning comfortably, beating Poland 371-234; the fancied team from Monaco came third, beating Ireland in the play-off to take the Bronze medal. In the Women’s Championship, England retained their title, winning the event by 209-140 against Russia, with Poland beating France and taking the Bronze Medal. In the increasingly popular Seniors Championship, again played with a very strong field, the Hungarian team beat USA in the Final to take the title, with France comfortably taking the Bronze against Sweden in the play-off. 1. ITALY: Giorgio Duboin, Fulvio Fantoni, Lorenzo Lauria, Claudio Nunes, Antonio Sementa, Alfredo Versace, Maria-Teresa Lavazza (NPC), Massimo Ortensi (Coach). 2. ENGLAND: David Gold, Jason Hackett, Justin Hackett, Artur Malinowski, Nicklas Sandqvist, Tom Townsend, Phil King (NPC), Simon Cope (Coach). 3. NORWAY: Terje Aa, Glenn Grøtheim, Geir Helgemo, Tor Helness, Joergen Molberg, Ulf Tundal, Sten Bjertnes (NPC), Inger Hjellemarken (Coach). After the 29th Summer Olympic Games in August and the 13th Paralympics that followed in September, China was not yet finished playing host to the rest of the world in 2008: at the beginning of October the stage was set for the first edition of the World Mind Sports Games (WMSG), a gathering of some 3000 people from over 140 countries and regions competing in one of five disciplines: Bridge, Chess, Go, Xianqi (Chinese Chess) and Draughts. Media coverage, perhaps building on the standards established at the Olympics and Paralympics, was extensive, with nightly Chinese TV broadcasts and daily newspaper reports. The World Bridge Teams Olympiad assumed its new name of World Bridge Games and was incorporated in the World Mind Sport Games. 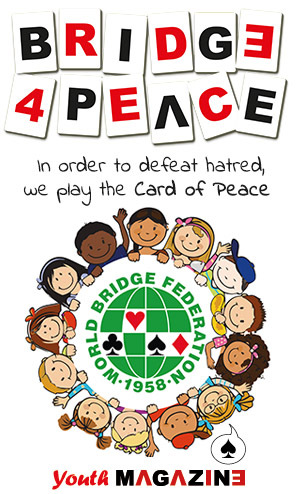 With approximately 2,000 players from 92 countries participating, Bridge was the main event at the WMSG. The Open and Women’s events commenced with six days of round robin competition (16-board matches, IMPS converted to VP) in seeded groups of 16-18 teams to qualify 16 teams for the knockout stage. The 71 teams in the Open series (one short of a perfect 72) were seeded into four groups, each producing four teams for the Round of 16, the winner of each group earning the privilege of choosing its opponent from the third- and fourth place finishers in its companion group (A with B; C with D). Once those selections were made, the rest of the draw was completed in accordance with a pre-determined formula, so winning the group was, at least in theory, a significantadvantage. In the 96 board final a highscoring first set gave Italy a 16-IMP lead, but the second set was much more dynamic: Italy won it 46-4 to lead by 58 one-third of the way through the match. The young English team fought back with two good sets of their own to cut the deficit to 20 with 32 to play. 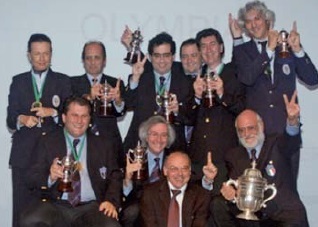 Italy gained 15 IMPs in Segment 5, and conceded only 5 IMPs over the final 16 boards to win the first WBG Open Teams under the WMSG umbrella, effectively defending the Olympiad Open Team title earned in Istanbul in 2004. The final margin in the well played final was 30 IMPs. This gave Italy its sixth title in this competition, increasing its impressive record. Norway added the bronze to its remarkable collection of medals. In the Women’s event, the final was a match that will be discussed for years. Who knows how great the pressure was on the Chinese women to win the World Championship on their home turf, with the greatest national media coverage the sport had ever received? But in the end England won by 1 IMP! 32 teams entered the Seniors and were seeded into two groups of 16, with half the teams in each round robin group qualifying for the knockouts. The field was very strong at the top. So many matches were like “A Tale of Two Cities” with shades of ‘the best of times’ and the ‘worst of times’. Take this one, for example, in which highly fancied USA came out of the chute like a bull bent on wiping out anyone unfortunate enough to get in its way. The Americans won the first set 60-28 and tacked on 4 and 7 IMPs in the next two to lead by 43 at the end of the first day of play. But the new day brought a dramatic change of momentum: Japan won Sets 4 and 5 by identical 44-12 scores to take a 21-IMP lead into the final stanza. 1. ITALY: Norberto Bocchi, Giorgio Duboin, Fulvio Fantoni, Lorenzo Lauria, Claudio Nunes, Alfredo Versace, Maria Teresa Lavazza (NPC), Massimo Ortensi (Coach). 2. THE NETHERLANDS: Sjoert Brink, Bas Drijver, Jan Jansma, Ricco Prooijen, Maarten Schollaardt, Louk Verhees Jr, Antoine van Hoof (NPC), Anton Maas (Coach). 3. RUSSIA: Alexander Dubinin, Andrei Gromov, Jouri Khokhlov, Max Khven, Georgi Matushko, Vladimir Rekunov, Boris Sazonov (NPC). The 12th Bridge Olympiad was staged in Turkey, and despite some forebodings over the choice of venue, resulted in one of the most successful such events ever held. The Open Series once again had 72 competing teams, and the Women’s series saw 43 teams participating. As before, the Open Teams were divided into four sections and the Women’s teams into two sections, playing a complete round robin to determine the teams to go through to the Knock Out phase. Italy took the Open title once again, defeating The Netherlands in the Final. Russia defeated China in the play-off to take the Bronze Medal. Winning the World Bridge Games created two new Italian Grand Masters – Fulvio Fantoni & Claudio Nunes. In the Women’s series, the surprise of the Championship came when a young Russian team took the Gold Medal defeating the experienced USA team. England took the Bronze Medal, defeating China in the playoff. In the Seniors Teams the entries increased with 29 teams taking part. USA again took the title, although with a completely different team. 1. ITALY: Norberto Bocchi, Dano De Falco, Giorgio Duboin, Guido Ferraro, Lorenzo Lauria, Alfredo Versace, Giancarlo Bernasconi (NPC), Carlo Mosca (Coach), Maria Teresa Lavazza (Team Manager). 2. POLAND: Cesary Balicki, Krzysztof Martens, Michal Kwiecien, Jacek Pszczola, Piotr Tuszynski, Adam Zmudzinski, Wojtek Siwiec, Jan Rogowski (NPC). 3. USA: David Berkowitz, Larry Cohen, Steve Garner, George Jacobs, Ralph Katz, Howard Weinstein, Chip Martel (NPC). The 11th Bridge Olympiad was held in Maastricht, the Netherlands, 40 years after the first Bridge Olympiad in 1960. Another record was achieved in the Open Series, where there were 72 competing teams divided into four sections each playing a complete round-robin. For the first time the knockout phase started with a round of 32, followed by quarter-finals, semi-finals and the final. 40 teams competed in the Women’s series, being divided into two groups for the Round-robin, which again determined the teams to enter the round of 32. In the closely fought Open teams final, Italy defeated Poland by 269-249 to take, after 28 years, its fourth gold Olympic medal. For the second time in the history of the Olympiad, this was to be the first of three successive Olympiad victories gained by Italy. For the first time, the three countries of England, Scotland and Wales competed under their own flags instead of as Great Britain, with England reaching the bronze-medal play-off where they lost to USA. In the Women’s Series, the USA team defeated Canada by 176-144, while Germany took the bronze medal in a play-off against Norway. The World Seniors International Cup was introduced for the first time in Maastricht, alongside the World Teams Olympiad, took place. 24 National Senior Teams participated, and the Cup was won by the USA team. Robert Wolff was a member of the winning team and by doing so became the only player ever to win World Championships in five different events. 1. FRANCE: Marc Bompis, Alain Levy, Christian Mari, Hervey Mouiel, Franck Multon, Henri Szwarc, Jean-Louis Stoppa (NPC). 2. INDONESIA: Franky Steven Karwur, Henky Lasut, Eddy Manoppo, Santje Panelewen, Denny Jacob Sakul, Giovanni Watulingas. 3. DENMARK: Morten Andersen, Jens Auken, Lars Blakset, Soren Christiansen, Dennis Koch-Palmund, Lauge Shaffer. The 10th Bridge Olympiad was played in Rhodes, Greece. Celebrating the 100th anniversary of the Olympic Games, the World Bridge Games registered a record participation with 71 Open Teams and 44 Women’s in two series. The fields in both series were divided into two sections, playing a complete round-robin within each section to decide the quarter finalists. The Open Series played four 16-board matches each day, the Women’s series three 20- board matches. In the Open final, France retained the Trophy, beating Indonesia by 358- 269. Only two members of the 1992 team, Alain Levy and Hervé Mouiel played. The bronze medal went to Denmark. In the Women’s final, the USA team beat China by 268-198 with Canada taking the Bronze Medal. To check all results of this championship, please click here. 1. FRANCE: Pierre Adad, Maurice Aujaleu, Paul Chemla, Michel Perron, Alain Levy, Hervé Mouiel, José Damiani (NPC). 2. USA: Seymon Deutsch, Robert Hamman, Jeff Meckstroth, Michael Rosenberg, Eric Rodwell, Robert Wolff, Dan Morse (NPC). 3. THE NETHERLANDS: Wubbo de Boer, Enri Leufkens, Bauke Muller, Jaap van der Neut, Marcel Nooijen, Berry Westra, Jaap Trouwborst (NPC). The 9th NEC Inter-Nations World Bridge Teams Olympiad was also played in Italy, but this time at Salsomaggiore Terme. This event, scheduled initially in Brazil was moved just a few months beforehand to Salsomaggiore Terme in what can only be described as very successful organization by the Italian Federation and its President, Gianarrigo Rona, under the guidance of the WBF President Ernesto d’Orsi. The 57 teams in the Open Championship were divided into two groups for the round-robin, with the leading four teams from each qualifying for the knockout stages. In the final France beat the USA 251-171. The runners-up were the same as the team that won in 1988, except that Michael Rosenberg replaced the late Jim Jacoby. The Netherlands took the bronze medal. The 34 teams that contested the Women’s series were also divided into two groups but they played a double roundrobin. In the final, Austria beat Great Britain 266-218. France took the bronze medal. Norway won the WBF Swiss Plate. 1. USA: Seymon Deutsch, Robert Hamman, Jim Jacoby, Jeff Meckstroth, Eric Rodwell, Robert Wolff, Dan Morse (NPC). 2. AUSTRIA: Heinrich Berger, Jan Fucik, Alfred Kadlec, Fritz Kubak, Wolfgang Meinl, Franz Terraneo, Franz Baratta (NPC). 3. INDIA: Rajesh Dalal, Santanu Ghose, Avinash Gokhale, Kamal Krishna Mukherjee, Debashish Roy, Jaggy Shivdasani, Veerubhotla Sharma (NPC). The 8th Bridge Olympiad was held in Venice, Italy, which hosted the event in a memorable way, which is still regarded as one of the best in the history of the bridge championships. In the Open USA won this competition for the first time from a field of 57 teams, divided into two groups, each of which qualified four teams for the quarter-finals. In these USA beat Denmark, India beat Greece, Austria beat Great Britain, and Sweden beat Italy. In the semi-finals, the USA beat India and Austria beat Sweden. The USA led throughout the final to win by 289.7 IMPs to 247. The Women’s Series was split into three, again qualifying eight teams to the knockout phase. Denmark defeated Great Britain by 178-157 IMPs in an exciting final. 1. POLAND: Piotr Gawrys, Krzysztof Martens, Tomasz Przybora, Jacek Romanski, Piotr Tuszynski, Henryk Wolny, Marian Frenkiel (NPC). 2. FRANCE: Paul Chemla, Felix Covo, Herve Mouiel, Fivo Palladino, Michel 1984, Seattle – USA Perron, Henry Szwarc, Pierre Schemeil (NPC). 3. 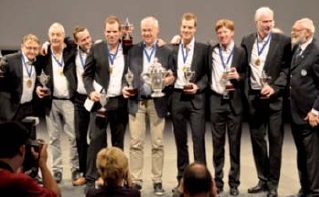 DENMARK: Jens Auken, Knud-Aage Boesgaard, Peter Schaltz, Steen Schou, Stig Werdelin, Jens Kruuse (NPC). The 7th Bridge Olympiad was held in Seattle, State of Washington, USA. The Open was won by Poland from a field of 54, divided into two groups, each of which qualified four teams for the quarterfinals. In these Poland beat Pakistan; France beat Indonesia; Denmark beat Italy and Austria beat the USA. In the semi-finals France beat Denmark 164-149 and Poland beat Austria 147-143. Poland led throughout the final to win by 236 IMPs to 156. The Women’s Series played a complete round-robin, also of 20-board matches. The final was won narrowly by USA They defeated Great Britain by 109 1/2 IMPs to 99, having started with a carryover of 22 1/2. The losing semi-finalists were France and the Netherlands. 1984 also saw a new competition, the WBF Swiss Plate, for teams that failed to make the semi-finals. New alignments were permitted as long as all the players were from the same country and had competed in either the Open or Women’s Series as players or non playing captains. 1. 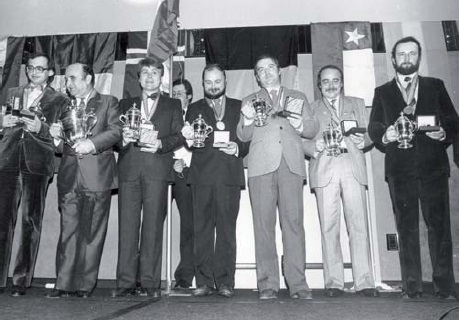 FRANCE: Paul Chemla, Michel Lebel, Christian Mari, Michel Perron, Philippe Soulet, Henri Szwarc, Pierre Schemeil (NPC). 2. USA: Fred Hamilton, Robert Hamman, Mike Passell, Ira Rubin, Paul Soloway, Robert Wolff, Ira G. Jr. Corn (NPC). 3. THE NETHERLANDS: Hans Kreijns, Anton Maas, Andre Mulder, Carol van Oppen, Hans Vergoed, Rene Zwaan, Kees Kaiser (NPC). The 6th Bridge Olympiad, held in Valkenburg, Netherlands, surpassed all previous attendance records – there were 58 Open teams and half that number of Women’s teams. A single round-robin was now impractical and the Open field had to be divided into two groups of comparable strength and geographical representation. This was hard to achieve and the task was made more difficult by the inability, due to government intervention, of a number of teams to play against South Africa. Each of the two groups played a round-robin of 20-board matches. Four teams emerged from each group to contest the semi-finals, again on a round-robin basis, the first and fourth placed teams from one group and the second and third placed teams from the other group being matched. In each semi-final, 32-board matches were played. The finalists proved to be France and USA, France winning the 88-board encounter by 131 IMPs to 111. This performance by France was outstanding, the team losing only one match during the two-weeklong event – to Chinese Taipei, in the semifinals round-robin. 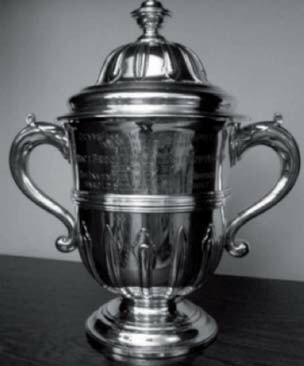 Thus the Vanderbilt Trophy returned to France after an interval of 20 years. The Women’s Series, a straight round-robin, was comfortably won by the USA ahead of Italy and Great Britain. USA lost only four of their 28 matches – three of these by a margin of only 11 victory points to 9! 1. 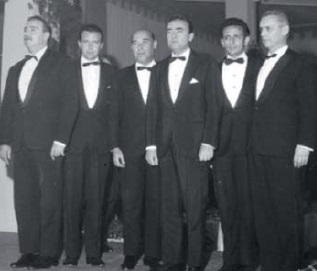 BRAZIL: Pedro-Paulo Assumpção, Sergio Barbosa, Marcelo Castello Branco, Gabriel Chagas, Gabino Cintra, Christiano Fonseca, Serge Apoteker (NPC). 2. 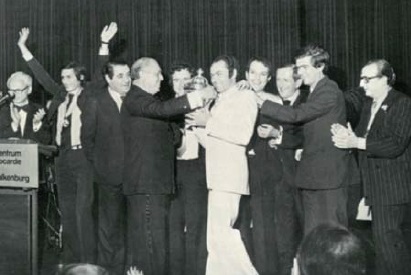 ITALY: Giorgio Belladonna, Pietro Forquet, Arturo Franco, Benito Garozzo, Carlo Mosca, Silvio Sbarigia, Sandro Salvetti (NPC). 3. GREAT BRITAIN: Willie Coyle, Jeremy Flint, Toni Priday, Terence Reese, Claude Rodrigue, Irving Rose, Robert Sheehan (NPC). Italy, who had seemed almost home, lost unexpectedly to Greece 17-3; whilst Brazil, who had seemed headed for fourth place, scored a surprise ‘blitz’ over Canada, bringing them to the top of the table, Italy was second, with Great Britain third and Poland fourth. 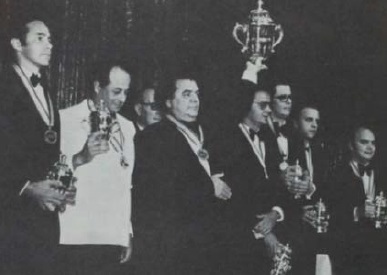 Thus the Vanderbilt Trophy went to the Western Hemisphere for the first time, whilst Brazil became the first NBO outside Zones 1 and 2 to win an Open Teams Championship. At the same time, Poland became the first nation from Eastern Europe to achieve prominence in any WBF event. In the Women’s Series, Italy retained their crown, finishing ahead of Great Britain and the USA in the 21-nation field. 1. ITALY: Walter Avarelli, Giorgio Belladonna, Massimo d’Alelio, Pietro Forquet, Benito Garozzo, Camillo Pabis-Ticci, Umberto Barsotti (NPC). 2. 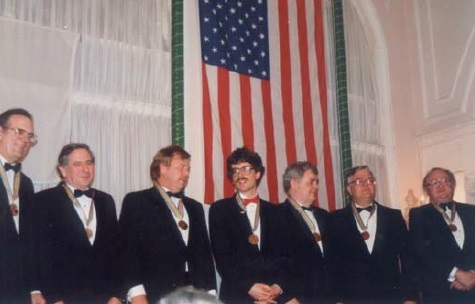 USA: Robert Goldman, Robert Hamman, Jim Jacoby, Michael Lawrence, Paul Soloway, Robert Wolff, Lee Hazen (NPC). 3. CANADA: Gerald Charney, Bill Crissey, Bruce Gowdy, Sammy Kehela, Eric Murray, Duncan Phillips, Al Lando (NPC). The 4th Bridge Olympiad was held at Miami Beach, Florida USA, with an Open field grown to 39. By doing without free days it proved possible to maintain the length of the round-robin matches at 20-boards, with 64-board semi-finals and an 88-board final. For the first time, boards were duplicated across the field, including the Women’s matches – a popular innovation. 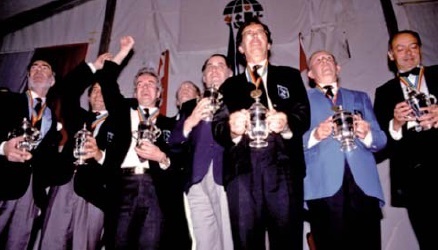 The Open was won by Italy again with the same team (which won also four consecutive Bermuda Bowls in 1965, 1966, 1967 and 1969), but once again with a different NPC, Umberto Barsotti. The USA were second, Canada third and France fourth. The Women’s Series, playing a straight round-robin, was also won by Italy with South Africa second and USA third of 18 contestants. Italy is the only country to have won both the titles in the same year. 1. ITALY: Walter Avarelli, Giorgio Belladonna, Massimo d’Alelio, Pietro Forquet, Benito Garozzo, Camillo Pabis-Ticci, Angelo Tracanella (NPC). 2. 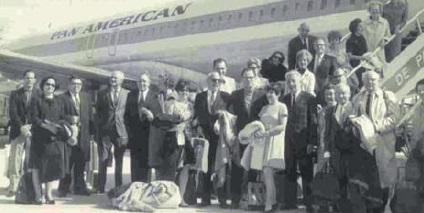 USA: Robert Jordan, Edgar Kaplan, Norman Kay, Arthur Robinson, William Root, Alvin Roth, Julius Rosenblum (NPC). 3. CANADA: Gerald Charney, Bill Crissey, Bruce Elliot, Sammy Kehela, Eric Murray, Percy Sheardown, Al Lando (NPC). 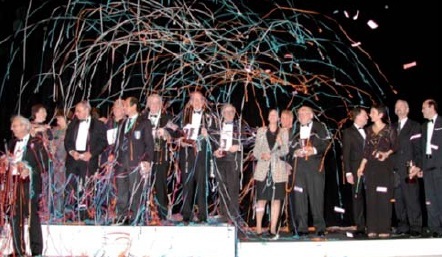 The 3rd Bridge Olympiad was held at Deauville, France, with 33 Open teams playing a format similar to that of 1964, but with round-robin matches of 20 boards and semi-finals and final of 80 boards. 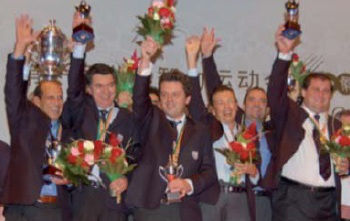 The event was won by Italy with the same Team as four years earlier, but with Angelo Trancanella as NPC. Runners-up were the USA, with Canada third and the Netherlands fourth. The 19-team Women’s Series was won by Sweden with South Africa second and USA third. 1. ITALY: Walter Avarelli, Giorgio Belladonna, Massimo d’Alelio, Pietro Forquet, Benito Garozzo, Camillo Pabis-Ticci, Sergio Osella (NPC). 2. 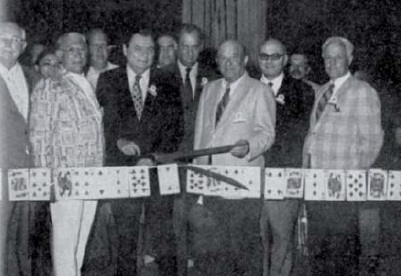 USA: Robert Hamman, Robert Jordan, Donald Krauss, Victor Mitchell, Arthur Robinson, Samuel Stayman, Frank Westcott (NPC). 3. GREAT BRITAIN: Jeremy Flint, Maurice Harrison-Gray, Kenneth Konstam, Terence Reese, Boris Shapiro, Joel Tarlo, Sidney Lee (NPC). Following the inaugural event, the Bridge Olympiad became a competition for one Open team and one Women’s team from each NBO. In 1964 it was held in New York, USA, with 29 teams in the Open and 15 in the Women’s Series. The Open consisted of a round-robin of 18-board matches, with the leading four teams qualifying for a 60- board semi-final and a 60-board final. The Open series was won by Italy. Runners-up were the USA, with Great Britain third and Canada fourth. 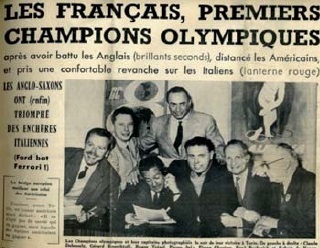 This was the first of three successive Olympiad victories gained by Italy. The Women’s series was a straight round-robin of 36-board matches, won comfortably by Great Britain. 1. FRANCE: René Bacherich, Gérard Bourchtoff, Claude Delmouly, Pierre Ghestem, Pierre Jaïs, Roger Trézel, Robert de Nexon (NPC). 2. GREAT BRITAIN: Jeremy Flint, Nico Gardener, Terence Reese, Albert Rose, Boris Shapiro, Ralph Swimer, Louis Tarlo (NPC). 3. USA: Jay Becker, John Crawford, Norman Kay, George Rapee, Sidney Silodor, Tobias Stone, Julius Rosenblum (NPC). 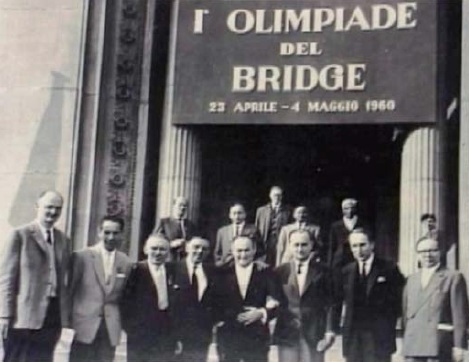 This first Bridge Olympiad was held in Turin, Italy, and was contested by 25 countries. In the Open Series there were actually 29 teams because – on this occasion only – a concession was made to NBOs with large memberships, the USA being allowed to enter four teams and Sweden two. In the Women’s Series 14 NBOs were represented, each by one team. Competing were, Australia (W), Austria (W), Belgium (W), Brazil, Canada, Chile, Denmark (W), Finland, France (W), Germany (W), Great Britain (W), Netherlands (W), Iceland, India, Ireland (W), Italy (W), Lebanon, Philippines (W), South Africa, Spain, Sweden, Switzerland (W), United Arab Republic (W), USA (W), Venezuela. The Open field was divided into three groups, leading to a six-team final. This was won narrowly by France from Great Britain. The Women’s Series, a straight round-robin, was won by an Egyptian team representing the United Arab Republic, who beat France narrowly – the two teams finished level on victory points, UAR taking the crown on IMP quotient.